What truly sets Victor Churchill apart is our people. Working tirelessly together they combine passion, experience and expertise to bring you the absolute best. Micky joined Victor Churchill just under 6 years ago having come directly from Oxford, England. Learning his trade in a traditional English Butchery, he honed his skills under the guidance of traditional English butchers with over 60 years experience between them. Micky featured in several UK competitions where he won awards in various butchery categories. Always an avid follower of Victor Churchill he jumped at the chance to move Down Under. Joining Victor Churchill in 2016, Terry brings a wealth of fine dining expertise with his impressive background of lauded restaurants and accolades. Starting his career at Tetsuya’s and Quay, he then worked at Sepia for seven years, where he was head chef for four years and won the esteemed Josephine Pignolet Young Chef of the Year award in 2012. When he’s not at the helm of the Victor Churchill kitchen, he’s handmaking his own bread, beer, whiskey, and cheese at home. Born and raised in Rome, a passion for food is intrinsic to Silvia’s Italian background. Moving to Australia in 2011, she fell in love with this incredible country. She comes to Victor Churchill from Fratelli Fresh in Potts Point, inspired by the community and beauty of the Victor Churchill store. Building relationships with regular customers every day is priceless to her. 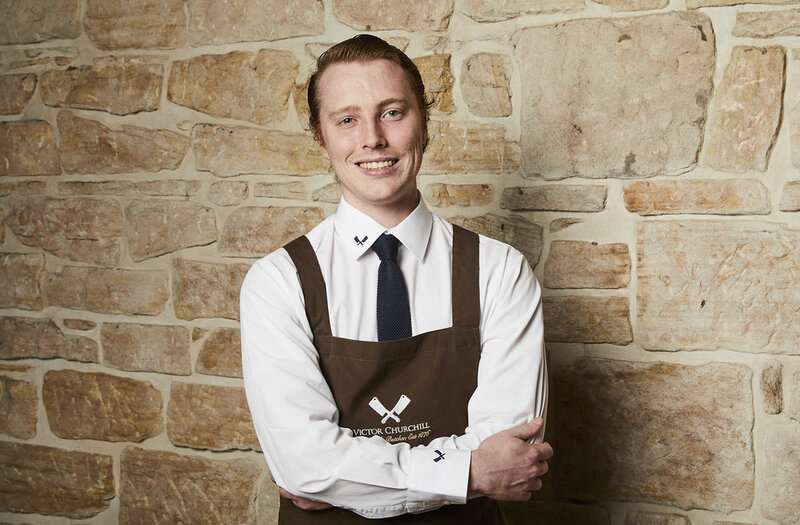 A local lad who brings a smile, Luke joined the Victor Churchill team as a qualified chef with over 5 years experience from venues across Australia. He offers friendly service and advice on the finest cuts of meat for either a special event or family meal. Luke’s creative mind will ensure visitors to Victor Churchill receive a delicious solution to any of their gastronomic needs. As a chef-turned-butcher, Darren has the edge when it comes to answering all your culinary questions. He worked at Bathers Pavilion with Serge Dansereau and at Bird Cow Fish with Alex Herbert, before swapping the pans for the cleavers. Working behind the butcher’s block allowed him a fresh challenge and more time at home with his beautiful children Hunter, Olive and Iris. His passion for butchery continues to take the craft to new levels. 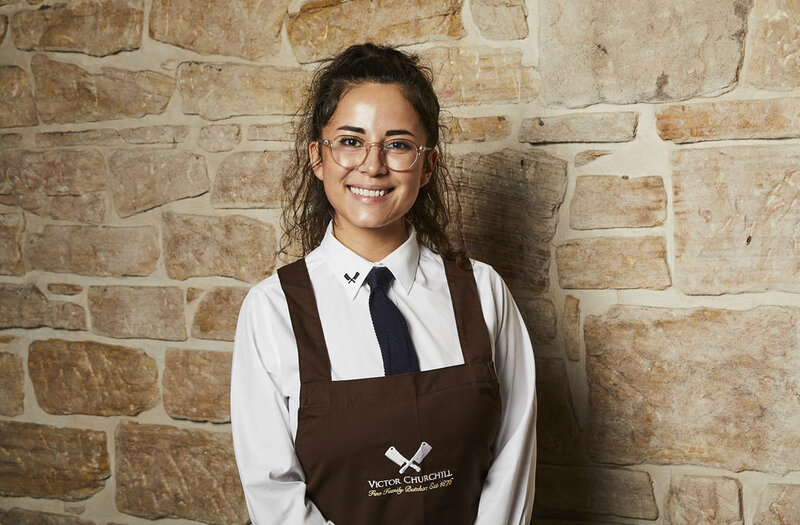 With a background as a pastry chef at Sepia and Bourke Street Bakery, Michelle brings fine dining experience and artistry to the Victor Churchill dessert cabinet. Her serious fascination with the world of pastry is not only because she enjoys eating it, but also an appreciation for the craft and technique. Seeing customers enjoy the beautiful desserts she handcrafts makes her incredibly happy. Victor Churchill is what inspired Dylan to relocate to Sydney from Los Angeles. After completing his apprenticeship in San Francisco, he returned to LA to work at several restaurants and butcher shops before making the move to Australia for Victor Churchill. He feels privileged to work with such high quality products day in day out. Tegan grew up in Newcastle and worked across numerous restaurants and patisseries in Australia, the UK, Ireland and New Zealand. Now joining the team at Victor Churchill, she loves working with such talented chefs. Starting out as a chef with Rockpool Group, Luci swapped the knife for a cleaver and moved to Newcastle to complete her butchery apprenticeship. Now back in Sydney, Luci considers Victor Churchill’s butchery team her family away from home. Before working at Victor Churchill, Andre was running some of Sydney’s best catering companies for A-list events and weddings as well as travelling to cater for celebrities around the globe. He loves that everyone in the Victor Churchill family thrives on learning as well as passing on their knowledge when it comes to food. 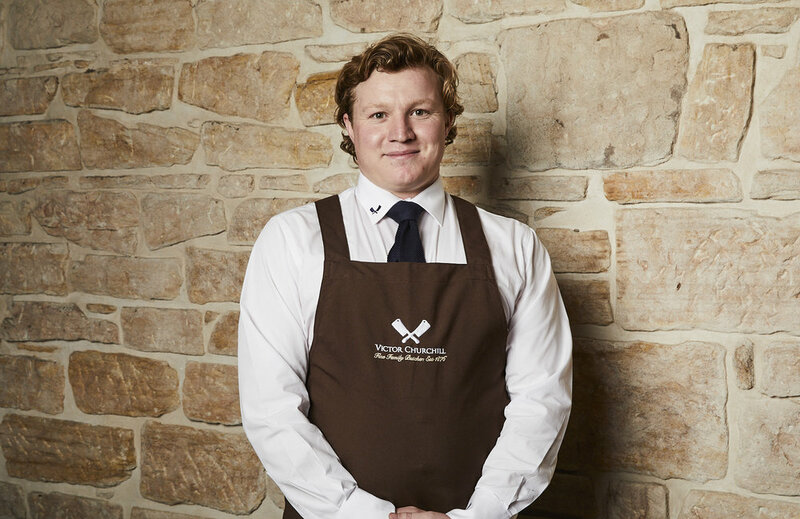 Originally from Banbury in the UK, Matt worked in the food industry since he was 16 years old. In 2016 he moved to Sydney, finding a new home at Victor Churchill where every day is different. The incredible products are a highlight for Matt, though a bit of celebrity hunting in store also rates high on his list. While completing her Business Degree, Jasmine has continued to refine her work in customer service. At Victor Churchill she loves working with a collaborative team and learning how to cook. Matt has been with Victor Churchill for two years. He is passionate about ethically sourced, quality produce. He is always the first one to notice new things in our cabinets and loves to get into the detail of our cuts and products. Alex was born in Germany, but has lived in Brazil, Canada, and the US before making the move to Australia. As an avid traveller, he loves getting to know cultures through their food. Now settling in at Victor Churchill, he’s fond of the quality and the integrity of the produce. Coffee slinger of seven years and roaster of three years in Sydney and Melbourne, William grew up just around the corner from Victor Churchill. For William, it’s been a pleasure to learn about food from a variety of perspectives - the butchery, the charcuterie, retail, and cooking. Colombian-born Maria was raised in Atlanta and schooled in New York - she has been on the move ever since. With her background in cake decorating and painting food illustrations, she brings an eye for food to Victor Churchill, where she loves the beautiful meat gallery and elegant display of products. Originally from the central tablelands of NSW in a town called Mandurama 40 km east of Cowra, Hugo is currently studying marine biology. Previously he worked at a boutique wine store that held pairing with food as integral to the business. His mother was a caterer which established a love of food at a young age. In his downtime, Hugo enjoys fishing, foraging and running a prime lamb farm.